Based on Lena's quote, I certainly know I'm alive as I bounce from one extreme to the other. 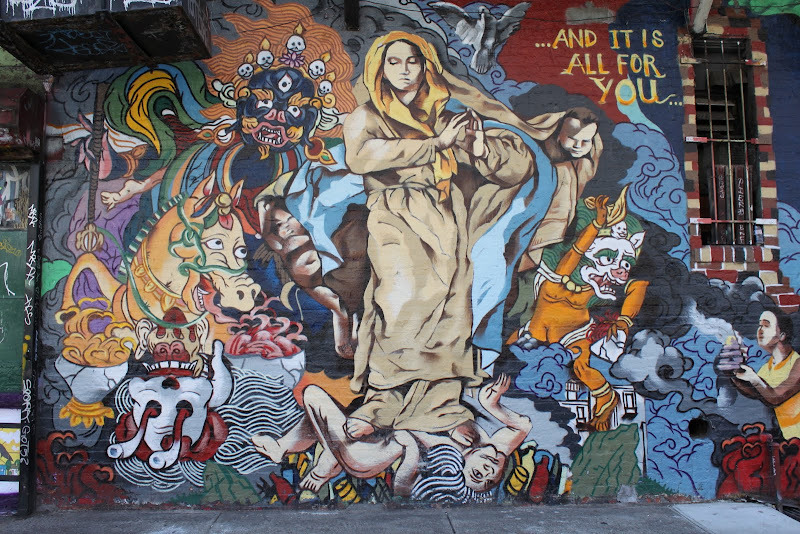 The East Village gives San Francisco's Mission district a got run for its money in the mural department. Wow - amazing mural. And I think Lena's right. That's a great mural! ArtSparker has a point, although I'm wondering if it wasn't a Left Coast expatriot who may have painted it; there's definitely a California feel to the mural, especially the use of Hindu deities. i love this! gera is one of those types of artists who needs to draw BIG - like this! our Marilyn is really a mural now that i think about it! I love The Wall but theys got some crazy images don't they? !